The graceful Chinese musician Yang Xue (32) is a young erhu performing artist and composer. She is also a teacher at the Traditional Instruments Department of the renowned Central Conservatory of Music in Beijing. She plays the erhu with elegance and solemnity. The erhu is a two-stringed, bowed musical instrument, also called the 'southern fiddle' and sometimes known in the Western world as the 'Chinese violin'. It is used as a solo instrument as well as in small ensembles and large orchestras. It is the most popular of the huqin family of traditional bowed string instruments used by various ethnic groups of China. As a very versatile instrument, the erhu is used in both traditional and contemporary music arrangements, such as in pop, rock and jazz. Yang Xue is a council member of the China Nationalities Orchestra Society (Huqin Committee) and a member of the Erhu Society of the Chinese Musicians Association. Yang Xue was born from a musical family in the Chinese province of Liaoning. Her father is a composer and he likes playing the erhu which he learnt by himself. He graduated in music composition and during his college years he studied the erhu with a famous professor. Yang Xue's mother was a violin player, but she is a housewife now. Yang Xue started studying the erhu with her father at the age of 4 and she has studied and played the instrument for 28 years now. 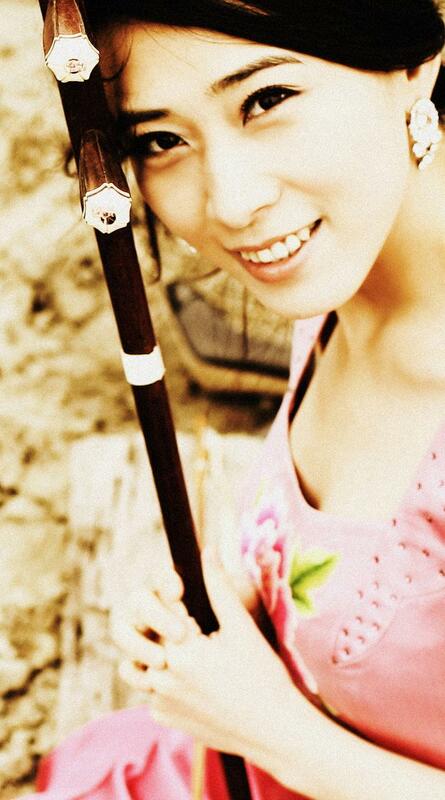 Yang Xue says:" I love the tone of the erhu, it's close to the human voice and goes straight to your heart. When I was young I listened to someone playing the erhu so beautifully but when I played it for the first time, the sound was not pleasant, unlike the piano or the guzheng. Eastern and western string instruments do not sound very good when first played. The erhu is the most popular traditional instrument in China. Overseas, more and more people know it and are learning how to play, especially in Japan where the erhu is really popular, with lots of Japanese being able to play it." "Besides the erhu, I can play the piano a little bit. I can also play the jinghu, the banhu, the gaohu and the zhonghu which are Chinese traditional bowed string instruments of the huqin family". At the age of 10 she moved to Beijing where she has lived for 22 years. Also at the age of 10 she was admitted to the Associated Elementary School of the Central Conservatory of Music in Beijing, where she studied with Professor Zhao Hanyang and Associate Professor Yan Jiemin, both distinguished erhu players. Yang Xue adds: "I spent twelve years under the mentorship of Professor Zhao Hanyang, a renowned contemporary erhu master who teaches technique and philosophy based on the progress and level of musical knowledge. He specially designs lessons that fulfill my requirements and preferences across different levels, genres and styles." She also had the privilege of broadening her knowledge of erhu by studying with prominent maestros including Professor Wang Guotong, Professor Min Huifen, Professor Chen Yaoxing and Professor Yang Guangxiong. Besides the erhu, Yang Xue has also studied banhu with Professor Li Heng. The banhu is also a Chinese traditional bowed string instrument of the huqin family and is used primarily in northern China. Ban means a piece of wood and hu is short for huqin. Like the more familiar erhu and gaohu, the banhu also has two strings, is held vertically, and the bow hair passes in between the two strings. The banhu differs in construction from the erhu in that its soundbox is generally made from a coconut shell rather than wood and instead of the snakeskin that is commonly used to cover the faces of huqin instruments, the banhu uses a thin wooden board. Yang Xue continues: "I have played a lot of different types of musical pieces, including contemporary and traditional works. In 2012, I premiered dozens of solos, music with ensembles and concerto works." Twelve years ago, Yang Xue also studied music composition for the erhu with Professor Xu Zhenmin. She wrote and arranged a few erhu pieces. She was able to graduate early and was admitted without examination into the Central Conservatory's Graduate Program to further her studies due to her exemplary academic results throughout her undergraduate years. After receiving her master’s degree, she became an erhu instructor at her alma mater. Yang Xue has won prizes in competitions such as the 8th Taipei International Traditional Chinese Instrument Concerto Competition and other national and international competitions. Many of her students are prize winners. She was also awarded best instructor several times. Her thesis includes a lecture on Cultivating the Concept of Playing the Erhu and its Environment, Random Thoughts about the Erhu, My Understanding after Playing 'Erhu Concertos', and on erhu concerto 'Totem'. She was also selected to be featured in the Chinese Musical Classics, Erhu Volume and Who’s Who of world-famous huqin players. Yang Xue has been invited to perform at international musical festivals, such as the Musical Festival of China in Holland, the Venice International Musical Festival, the Musical Festival of Malaysia, the Musical Festival in Macao, the Atlas Musical Festival in Holland, the Chinese Culture Festival in Cuba, the Chinese Art Festival in Jamaica, the Chinese Culture Festival in Mexico, the Musical Festival of Azerbaijan, the Musical Festival of the Central Conservatory of Music, the evening celebration programme on New Year’s Day of CCTV, the Beijing Modern Musical Festival and many others. She has collaborated and performed with local orchestras including the Holland New Ensemble, the France Classical Music Ensemble, Gooco Drum Ensemble in Japan, Hong Kong Philharmonic Chinese Orchestra, Hong Kong YWCA Chinese Orchestra, Taipei Chinese Orchestra, Little Giant Chinese silk and bamboo ensemble, Gaoxiong Chinese Orchestra and the Tianjin Symphony Orchestra. She has also played for numerous dignitaries and heads of states in many international events. She has played in numerous concerts and given lectures in Beijing, Shanghai, Hong Kong, Taiwan, Japan, Malaysia and many other Asian countries as well as Holland. "For my concerts," she says, "I choose several pieces of music based on the requirements of the programme and I may consider banhu pieces. In some musical works, it allows me to play both instruments, erhu and banhu, in one piece of music. The tone of the erhu is muted while that of the banhu seems more resonant. Both musical instruments are mainly used in traditional Chinese operas and folk music accompaniment: the erhu in southern China and the banhu in northern China. The body of the erhu can be made of rosewood (hong mu), red sandalwood (zi tan) or ebony wood (wu mu). Its front is covered with snakeskin. I play on a custom-made erhu, with standard quality." Yang Xue was appointed Principal of the Chinese National Youth Traditional Folk Music Orchestra and performed numerous works such as 'Totem', 'Erhu Concerto No.1', 'Why are the Flowers Fiery Red' and other famous masterpieces. Yang Xue is dedicated to exploring new compositions for erhu as well as musical rearrangements. Her recent work in recording and producing has brought her into contact with a large number of musical works of different styles, providing her with a rich variety of artistic influences and a vast experience. She has produced several CDs including 'Erhu Graded Examinations Practical Demonstrations', 'Erhu for Beginners', 'Totem', 'It’s live now' and 'Dancing with the Wind - Yang Xue’s Random Thoughts in Erhu'. Her performances have been known to express 'Music and mind as one'. Yang Xue says: "I endeavour to convey a strong aesthetic and artistic dimension in my performances through outstanding techniques as well as the understanding of musical culture." Her style of playing has gained the title of ‘Music with Beauty and Elegance’. Yang Xue explains: "Beauty and Elegance is a Chinese expression translated into English, used by a famous musical critic, commenting on my style. Many people think this fits my style very well." Thriving on art, knowledge of all kinds and the ability to explore many ways of thinking, Yang Xue pursues her path through art and culture with hard work and determination. As well as being a performer, she emphasises the importance of erhu education, rearranging works such as 'A Pleasant Night', 'Por una Cabeza', 'Melody of Northeast' and setting up the Erhu ensemble 'The Dance of the Strings and Bows' which premiered pieces like the 'Facial Painting', 'Tango' and others. The students have held many erhu ensemble concerts which have provided them with an ideal platform to acquire performing experience. Yang Xue is also one of the founders of a chamber ensemble called 'Styles of New'. Furthermore she is employed by the Aerospace National Music chamber ensemble. 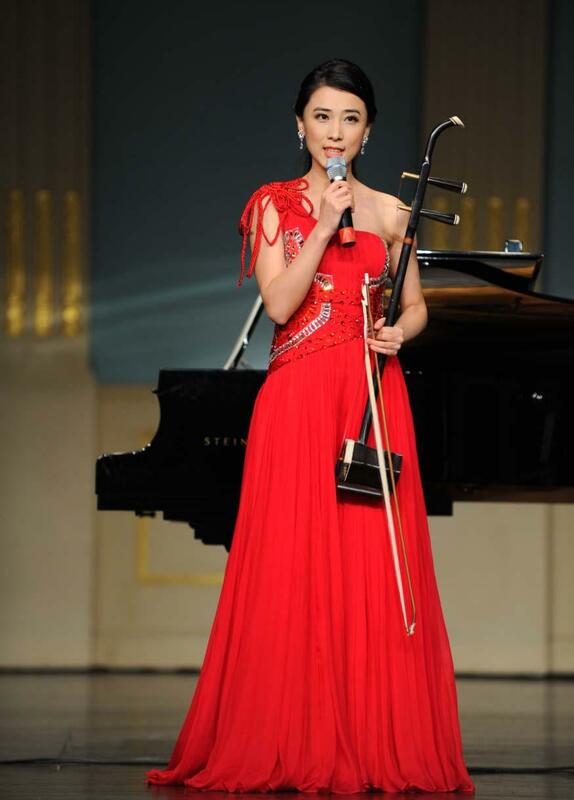 She is known as "one of the outstanding erhu artists of the younger generation."